A number of anti-government protests have taken place in Turkey over the past year. Erik R. Tillman assesses the dynamics underpinning support for the ruling AKP government and its main opposition, the Republican People’s Party (CHP), during the unrest. He notes that although AKP has parallels with mainstream centre-right parties in Europe, its support base is built on working-class voters. He argues that as the protests largely articulated concerns associated with middle class voters, this ‘ideological reversal’ has so far helped to protect the AKP electorally. Nevertheless, the dynamics of the most recent protests over the mining disaster in Soma could pose a threat to the governing party as they are closely associated with its core working class support base. During the past year, the government of Turkish Prime Minister Recep Tayyip Erdoğan has faced a series of protests over its increasingly authoritarian style of governance and a series of scandals regarding alleged high-level corruption. However, Erdoğan does not appear to have lost significant popular support. In municipal elections on 30 March, his Justice and Development Party (AKP) won a comfortable plurality of the national vote. How has the Erdoğan government retained its popularity in the face of these protests? An examination of the nature of mass party support in Turkey shows a reversed relationship between the apparent ideology of each major party and the social base of its support. The Gezi Park protests and subsequent outrage over alleged corruption have largely reflected the middle-class concerns of opposition supporters and have thus failed to shift the attitudes of many government supporters. If public outrage over the recent Soma mine disaster lingers, it could provide a more credible threat to the government’s popularity by shifting the attitudes of a core group of AKP voters. In contemporary Turkish politics, there is little congruence between the stated ideologies of the two largest parties and their actual bases of mass support. The governing Justice and Development Party (AKP) describes itself as a conservative democratic party and is affiliated with the Alliance of European Conservatives and Reformists. Conversely, the main opposition Republican People’s Party (CHP) describes itself as a social democratic party and is affiliated with the Party of European Socialists. Normally, one would expect the AKP to have more support among middle class voters and the CHP to derive most of its support from working class voters. Virtually the opposite is true. Survey data from Wave 6 of the World Values Survey (WVS), which was administered in Turkey in 2011, allows for an examination of party support in Turkey. Respondents were asked how they would vote if an election were held the next day. The survey responses in the WVS resemble the results of the parliamentary elections held in 2011: 52 per cent indicated that they would vote AKP, 32 per cent would vote CHP, 10 per cent would vote for the Nationalist Action Party, and 5 per cent for the Kurdish-leaning Peace and Democracy Party. I focus on support for the AKP and the CHP, as they are the two largest parties and of most interest for this analysis. At first glance, support for the two rival parties appears to fit normal ideological patterns. Respondents were asked to place themselves on a standard ten-point left-right scale of ideology. The first pair of columns in Chart 1, below, shows the average self-placement of each group of supporters. AKP supporters (7.23) place themselves significantly to the right of CHP supporters (4.42). This would appear to reaffirm a standard pattern of left-right party conflict. Note: The figures in the vertical axis indicate the mean self-placement of AKP and CHP supporters on a left-right scale from 0-10 (with 0 indicating left-wing views and 10 indicating right-wing views). 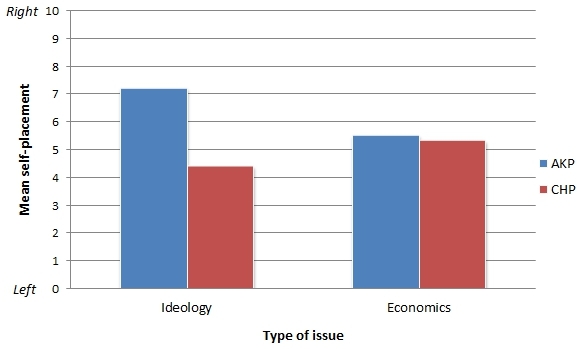 The ideology score is based on a single question in the World Values Survey, whereas the economic score is based on combined responses from six questions in the survey. However, the situation changes when one considers economic attitudes. The WVS asks respondents a series of questions about their preferences towards economic policy, with each question offering a left-wing (e.g. greater redistribution or government intervention in the market) and right-wing (e.g. less redistribution or increased privatisation) alternative. I combine and scale these six questions to create a ten-point index of economic preferences, shown in the second set of columns in Chart 1. The virtually identical average responses (5.52 for the AKP versus 5.33 for the CHP) to these questions suggest that there is little difference in economic ideology between the rival parties’ supporters. In short, ‘left’ and ‘right’ do not appear to reflect preferences for rival economic strategies. Examination of the class basis of support further highlights divergence between stated party ideology and party support in Turkey. Chart 2 below shows the level of support for each party by educational attainment. Those with less than a secondary education supported AKP over CHP by more than a three-to-one margin. However, a narrow plurality of university-educated respondents favoured the CHP. Note: The Chart shows the percentage of individuals within each group (based on 2011 World Values Survey respondents) who supported the AKP and CHP. A similar pattern holds if one examines the relationship between occupational type and party support. Respondents were asked to place themselves on a ten-point scale describing their duties at their job, with one pole indicating “mostly manual tasks” and the other indicating “mostly intellectual tasks.” As Chart 3 shows, plotting the support for AKP and CHP at each level of this scale produces a similarly counterintuitive result. Those who perform manual work are more likely to prefer to vote for the AKP, but this pattern reverses for those with jobs requiring intellectual tasks. 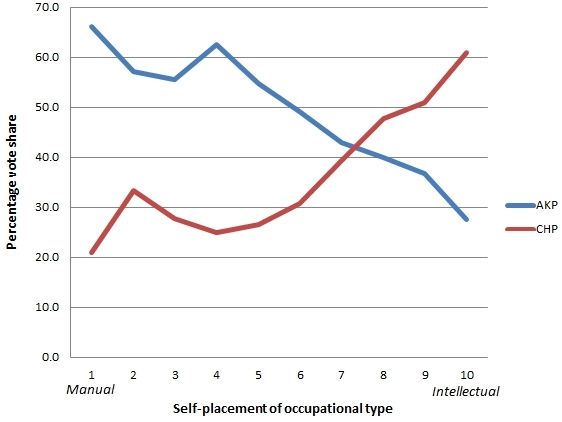 Note: The Chart indicates the percentage vote share for each party for individuals at every point on the “Manual-Intellectual” scale of occupation type presented in the horizontal axis (where 1 indicates a “manual” occupational type and 10 indicates an “intellectual” type of occupation). Figures are based on 2011 World Values Survey responses. Finally, aggregate data from an exit poll (in Turkish) conducted during the 30 March local elections reinforce these findings. There is a negative relationship between income and support for AKP. Those in the lowest income group (less than 700 Turkish liras per month) voted AKP over CHP by a 42 per cent to 18 per cent margin. However, 40 per cent of those in the highest income bracket (more than 3,000 TL per month) voted CHP, compared to 30 per cent for AKP. In short, the conservative AKP relies heavily on support from working-class voters, while the self-described social democratic CHP relies on support from middle-class voters. This reversed pattern of party support sheds light on why the protests and scandals of the past year have failed to harm AKP support. The Gezi Park protests emphasised essentially “middle-class” concerns about environmental destruction and Erdoğan’s increasingly authoritarian style of governance. In short, the Gezi Park protests largely overlapped with existing partisan divisions. Similarly, allegations of government corruption did not resonate with members of the AKP base, who did not view it as a threat to their interests. Crises such as the recent mining disaster in Soma, which has resulted in over 300 reported deaths, pose a more credible threat to Erdoğan’s public support. Surviving miners and engineers have described dangerous work conditions and lax safety regulations in the mine. AKP members had rejected an opposition motion to conduct a parliamentary inquiry into mine safety. Economists have noted that many of the Soma miners are indebted and work under a subcontractor system that limits their bargaining power. The Soma mine disaster, and the Erdoğan government’s response, directly affects the concerns of core AKP supporters. A national debate about the Erdoğan government’s role in facilitating the conditions that led to the mine disaster and that leaves miners vulnerable economically could weaken the support of the core working-class AKP constituency and create an opportunity for the opposition to gain support among these voters by emphasising a social democratic agenda. This analysis highlights the extent to which the link between party ideology and mass political support has become reversed in Turkey. While the Erdoğan government holds the support of working-class voters due to its religiously conservative style and a strong record of economic growth, it has also benefited from the lack of a substantive challenge from the opposition on issues related to workers’ concerns. This was not always so; centre-left parties gained larger shares of the working-class vote in the 1970s/1980s when they made more effort to prioritise social democratic issues. It is unlikely that the AKP dominance of Turkish politics will change without the CHP increasing its support among working-class voters.